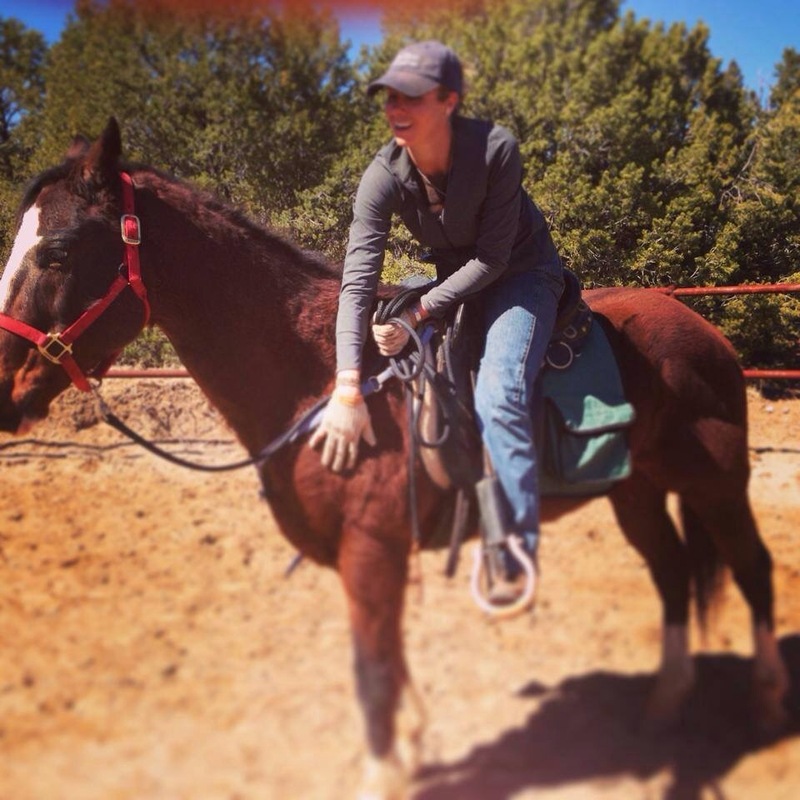 Thank you Julie Goodnight and Redmond Equine for picking our between the ears picture for the fave ride nation contest! We had a great day chasing hot air balloons with Enchantment Equitreks during the Balloon Fiesta Ride in October. Check out our picture and other fellow winners at Facebook. With winter finally rolling into the southwest we’ve been hard at work preparing for the oncoming snows. 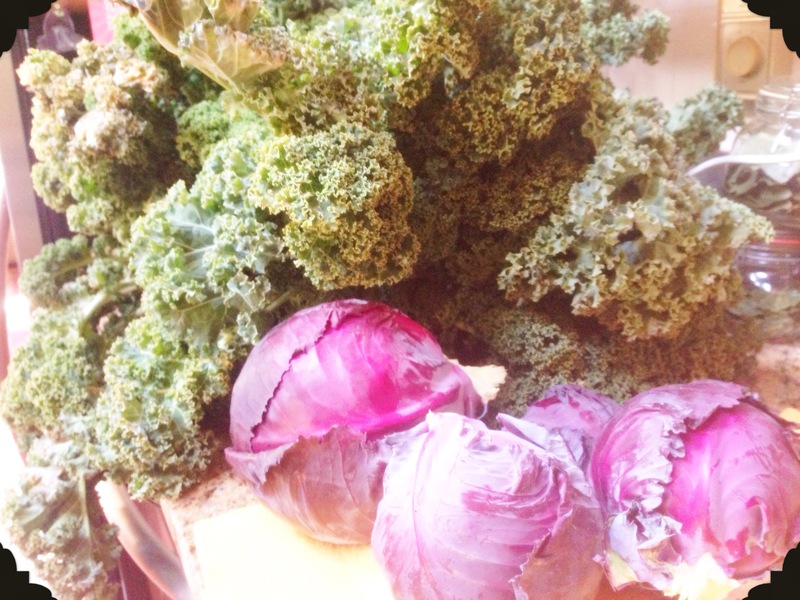 The last of the garden has been gathered, with a few purple cabbages and a bushel of kale. I’m looking forward to a warming soup of lentils and butternut squash from the storage. The patio chairs have been stacked and cushions stored until spring brings around dinner outdoors. Wood has been stacked and bird feeders filled. Even the tractor had its winter plow adjusted. 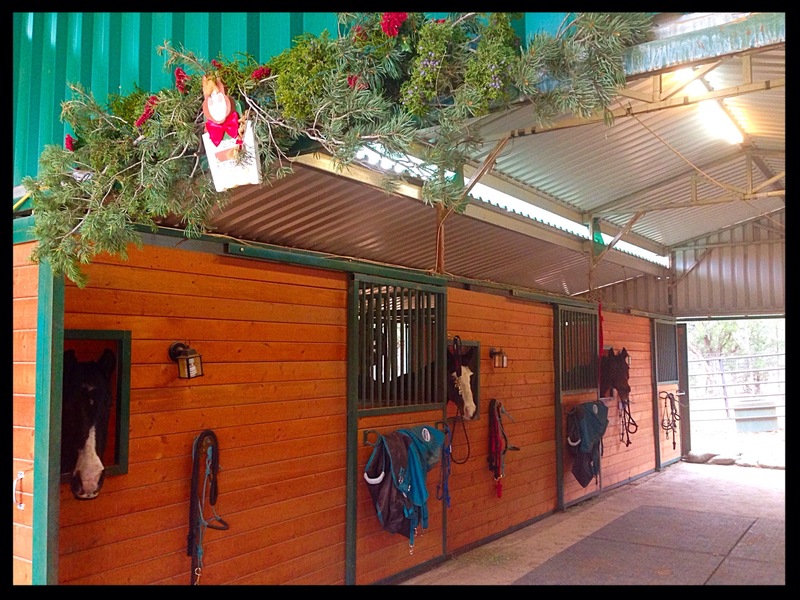 Our horses wait to be fed, blanketed, and settle in for the night. The days are ending so early now. We are all tucked in by the fire, the glow of the Christmas tree illuminates the room. A soft snow will fall, blanketing the ranch, and covering all our hard work of the last harvest. 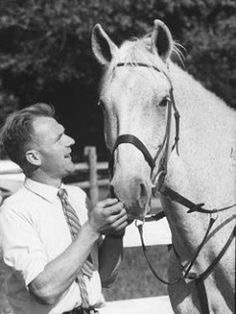 Harry and the Snowman is the newest documentary about Harry de Leyer and his grey gelding Snowman. ThIs is one of my absolute favorite equine stories. In 1956 Snowman, an old plough horse, was standing in a trailer waiting to be sold for slaughter. Harry took one look into the horse’s eye and knew he could be something great, however he didn’t recognize the horse’s talent until after he sold him to a neighbor and the big grey jumped the fence to return home. The pair went on to win many prestigious hunter jumper classes and even made a guest appearance on the Jonny Carson show. This eighty dollar, Cinderella horse became a priceless champion. This story has been immortalized in books but it Is listening to Harry speak about Snowman that offers the true insight into their exceptional relationship. These two had to fight to prove that they were just as good as any team competing. Harry knew that “every horse has a different personality, just like a human, and it’s like finding the key for the lock.” Apparently Harry was a master locksmith because Snowman trusted his rider completely and would jump anything Harry pointed him at. I believe that in order to find that key a horseman must understand the type of lock they are working with. Here at Enchantment Equitreks we come across many different horse personalities and usually we have limited or no information as to what created the lock. So we have developed a series of exercises to divulge the mechanisms of the animal. The easiest lock to rekey is the tune up. Horses like Teddy have all the working parts and foundation needed to be an excellent trail horse, however some bad manners and a threatening disposition landed him at a rescue. We recognized that all he needed was a little work to re-instill that training, kind of like a rusty padlock that pops open with a little D-W40. Then there are locks so mired in fear, frozen in pain, and welded shut in mistrust that the only option is to take the mechanism completely apart and slowly put each piece back. Our Jake is that type of horse. With each layer of gunk that we wipe away another deeper problem is divulged, which can be frustrating. This is when you have to start looking at the key you’re trying to use and retool the method. Often with Jake we have to reevaluate how we are approaching his training and adjust to better suit his needs. We also know we can’t force a lock like Jake and sometimes he needs a step back to be able to move forward. There are as many locks, as there are horse personalites, as there are keys. I live for the moment the mechanism slips open and the horse places its trust in you. However, it often doesn’t mean the horse is fixed, all locks need a little grease to keep them working properly, keys need to be refashioned , and parts reassembled. This is what makes rehabilitating rescue horses so intriguing and fulfilling, they are a constant puzzle just waiting for the correct code. Soothing the soul, quieting the mind, healing the body. 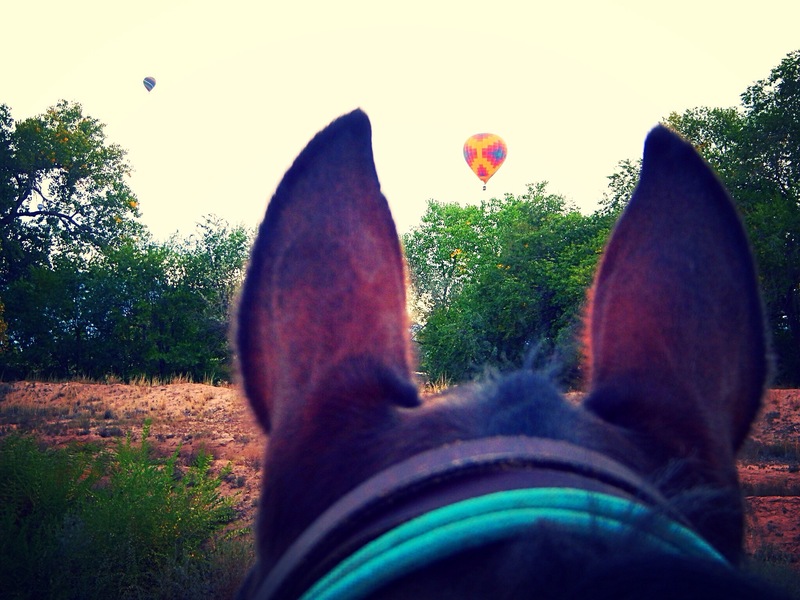 There is something about viewing the world through horses ears that can cure all. I was so very lucky join our friends at the Albuquerque International Balloon Fiesta and help crew their balloon Phobic. 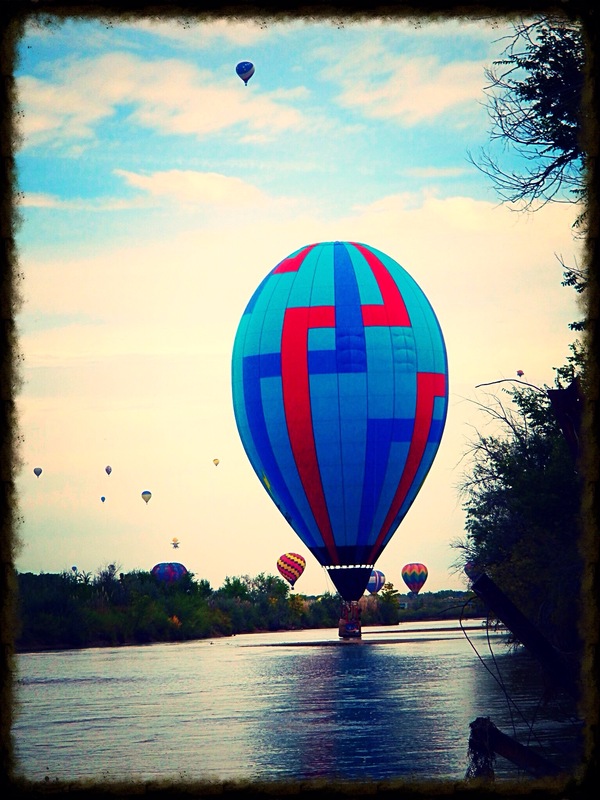 While the Balloon Fiesta is a tradition to may New Mexicans like my self, it is a once in a life time experience for people from all over the world. 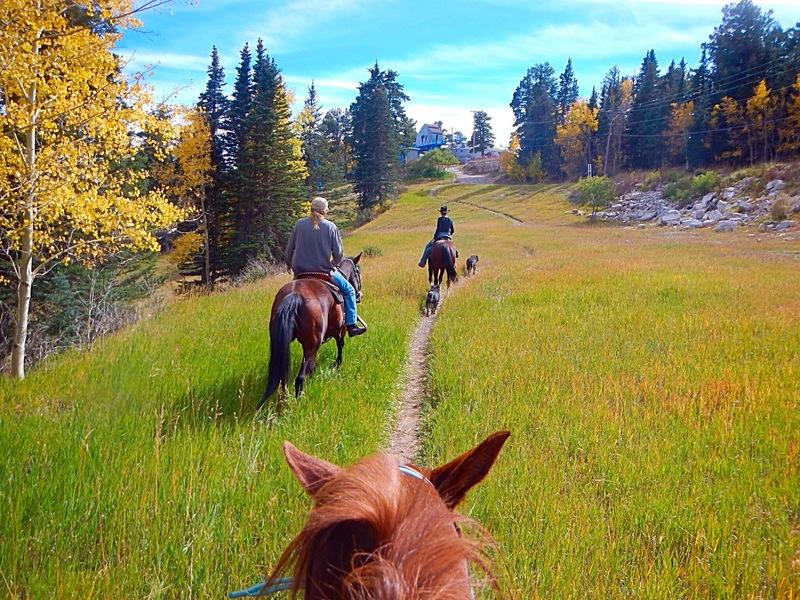 We want to share this event with our clients in the most unusual way possible… from the back of the horse. To fully encompass the experience our clients will learn first hand how these majestic floating beast work. From rolling out of the truck, to blowing them up, lift off and possibly even landing like I did. 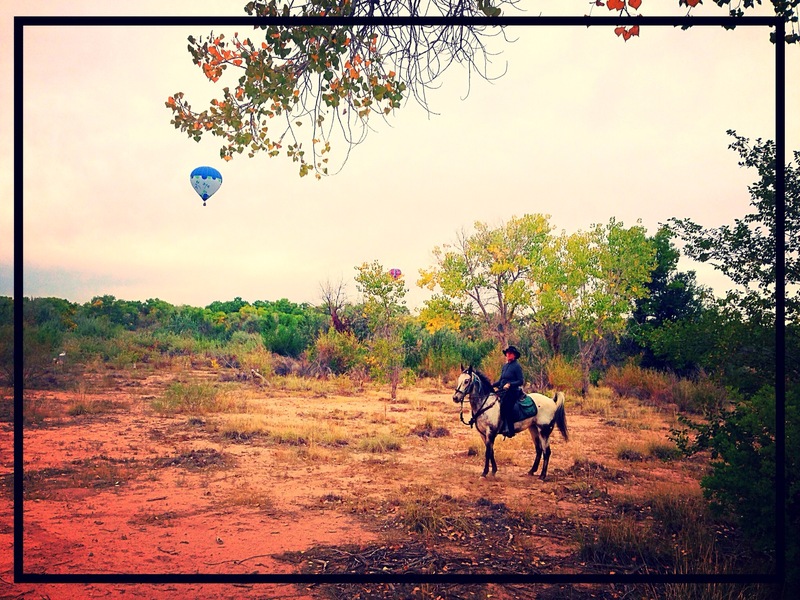 Pumpkin spiced coffee, ombré hued leaves and a crisp breeze usher in fall for so many, but here in New Mexico this season smells like roasting chili and sounds like the rush of helium lifting hot-air balloons. New Mexicans love to share these experiences with world and we want to show case them during our riding vacations. This morning came quick as we left the warmth of our beds for the dark before dawn. We were greeted with a blood moon eclipse hanging above and a cloud of breath from horses snorting in protest to their early wake up call. As we pulled out the front gate, reports of high winds and a possible field closure came in from our ballooning friends. Well we were already on our way… At least it would be a decent morning for a ride. 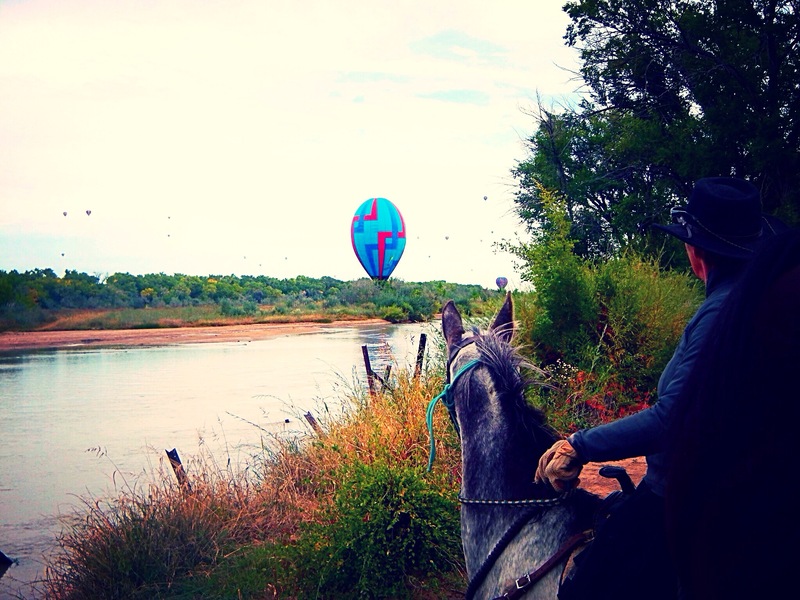 Our concerns grew as we rode out onto the sand of the Bosque. The sun began to peak out from the clouds and illuminate the cotton woods tinged in a soft gold. Then peaking behind a distant salt cedar was the out line of a balloon. Moments later waves of floating rainbows drifted over our heads, then drop down to splash in the muddy river, and lift off again to fill the sky with dots of magic. Our horses, at first unsure about the creatures overhead, watched in as much awe and wonder as their riders. I can only say it was the perfect New Mexico fall morning.